The EL-120 is a compact portable calculator with a number of unusual features, including an early multi-function fluorescent display tube with only three numeric digits. 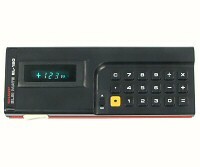 The calculator itself uses a unique 12-digit fixed-point format (9 integer digits and 3 decimal places), with the results displayed in set groups of three at a time (millions, thousands, units, decimals). The polarity indicator, decimal point, and one or two trailing commas are used as separators to provide an unambiguous display. The operator can scroll the sections of the display with the yellow key, or have them scroll continuously by setting the A/M switch to A. 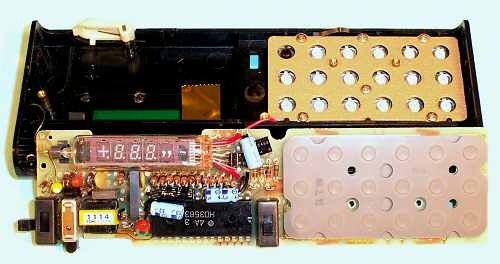 The calculator has a white "Count" button on the lower edge which increments the integer display by one unit, and there is a 15cm ruler marked on the underside of the case. The EL-120 uses an Hitachi HD3583 processor, with power supplied by three AA batteries. The batteries fit along the top edge, with the power switch on the left-hand end. Note the Japanese date code "49.2.18" (18 February 1974) on the keysheet. Original text and images Copyright © John Wolff 2003-18.